Should I go DO or MD? Apply Early! It Really Helps! I know this advice is coming a little late, but it is very important to get your application in right away! A few years ago, when I was applying to osteopathic schools, I turned in my application right away. I was early in the cycle. I had a decent application, nothing too special, but what I had going for me was timing and quality. I made sure that I got things in right away. That included getting secondary applications in right away. When I applied I sent in 10 initial applications, and they all asked for secondary applications. And right away I filled out 8 secondary applications. For one reason or another I decided against filling out 2 of the secondary applications. Of those 8 secondary applications I got 4 interviews and by mid October I had learned that I had been accepted to all 4 schools. Now, as I said before, I feel that I had a decent application, but nothing too spectacular. I was good enough that I met the requirements for MD and DO school applications, but I really wanted to be a DO and therefore I only applied to DO schools. Every school that I interviewed with mentioned that I had given myself an advantage by applying early. Osteopathic schools want students that truly want to be DOs, and I showed them that I really wanted to be a DO. I guess what I am trying to tell you is that if you don’t have your application in already, then you need to get the ball rolling! Get it in right away! With that said, make sure you do a good job. Don’t shoot yourself in the foot by having a poor personal statement, but we’ll talk more about personal statements in a later post. Osteopathic Med Student has posted more new GPA and MCAT scores. 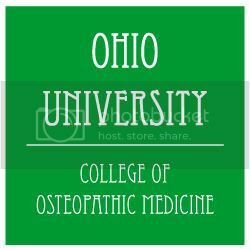 This time the numbers are for Ohio University College of Osteopathic Medicine. If you are interested in applying to OU-COM you should take a look at OU-COM’s MCAT and GPA stats. You should also take a look at a recent guest blog post by Diane Lui. Diane recently interviewed at OU-COM and provided us with a great review of her experience. Diane Lui recently had an interview with the Ohio University College of Osteopathic Medicine and was gracious enough to provide us with her experience about the interview day. Thank you. If anyone else out there has interview experiences please feel free to share. Email me at domedstudent at gmail dot com. For the students who are planning on getting to OUCOM the night before the interview, I recommend staying at the Holiday Inn Express or the Ohio University Inn. From all the reviews I read online, those two seem to be the most comfortable. I stayed at the Holiday Inn for about $100, so it wasn’t too bad; and another girl from my group stayed at the OU Inn and loved it. The interview day is from 830am-330pm. We had a group of 12 interviewees that day and everyone was really friendly; I’m pretty sure everyone was from Ohio. We spent the first hour or so in a conference room and Dr. Schriner from Admissions talked to us about the admissions process, the curriculum, clinical rotations, etc. Then someone from Financial Aid came to discuss loans, FAFSA, etc. Afterwards, our host for the day, Ginny Valentin (from Admissions) gave us a tour of the facilities and the 2 buildings where the med students have class. Because not all the students who enter OUCOM have the same anatomy exposure, the first month of med school is basically an anatomy immersion program. This is before students decide whether they want to pursue the Patient-Centered Curriculum (PCC) track or the Clinical-Presentation Curriculum (CPC) track. The anatomy lab is pretty nice. There are about 8 screens hanging from the ceiling, so the professor can demonstrate things and all the students can get a good view of it. I think the room holds 24 cadavers (not sure exact number). The OMM lab was big. Large demonstration area in the center, with screens for students to watch from. Nice OMM tables, not the older wooden ones. Afterwards, they fitted us for our white coats and took ID pictures. We thought it was kind of weird, but I assume this reduces the number of things that need to be done when the students attend orientation at the end of July. Had a delicious lunch, where we had time to chat with some current med students. Interviews were right after lunch, between 1-330pm. Each student had at least 3 1/2-hr interviews; some had 4 or 5 (if DO/PhD). They were very casual and the interviewers were super nice. It really felt more like a conversation than an interview. I was pretty nervous about them, but right when I walked in the door, I could tell that it wouldn’t be as bad as I expected. And they weren’t! Almost every interviewer asked “Why DO? Why OUCOM?” One asked about my strengths and weaknesses; another asked about my greatest challenge in life so far and how I handled it; why would you be a good fit at OUCOM? The majority of questions came from my file; ie. talk about volunteering, shadowing, etc. Almost all the questions were posted on the SDN Interview Feedback site, so that’s definitely a great resource. After the interviews, we were done for the day. After the students leave, the interviewers meet and make their final decision that day (Friday). Acceptances are emailed out that following Monday and that day, the official letters are mailed out as well. Overall, it was a wonderful experience and the Admissions Staff was amazing! You could really tell that OUCOM is a supportive community and all the students seem to love it there. When we were walking between buildings to get to our interviews, current students who were in class would wish us good luck and it just felt good to be there! During the interview day, we also had a van tour of the area around OUCOM, the city of Athens, “uptown” (it’s actually downtown, but you have to go up a hill), and places where current students live. It was nice to be able to check out the area outside of the school, since I probably wouldn’t have driven around on my own. If you are anything like me, then you want to know if you are competitive at a school before you spend all the money to submit initial applications and then another $40-175+ for secondary applications. I know I spent a fair amount of time searching out data about schools. Recently, I mentioned that I am working on upgrading features on this site. One of the features is that I am going to put up the most up to date MCAT and GPA statistics that I can find for each osteopathic medical school. I am working on collecting the most up to date MCAT/GPA information I can find. This may take a little while (I am still a student and school has to take priority), but if anyone out there has any information that they would like to contribute to this effort please let me know. If you are looking at this while preparing your applications for the next year or two then please check back soon. Updates are on the way. First Round of Acceptances Done! Students accepted to osteopathic school before November 15th needed to send deposits in by December 14th to hold their seats for fall 2009. This means a few things. Most importantly to those of you still in the application process, you now have a lot of seats available. This is a great time to be interviewing with schools. As I have mentioned before, I was accepted to a few different schools and I found it very difficult to decide which school to attend. Because I couldn’t make up my mind it took me a while to decline my seat at a few schools. Many people were in the same situation. I have given my deposit and accepted a spot at LMU-DCOM. This means that KCOM, WVSOM, and LECOM now have openings that were previously filled. A lot of people did the same thing, so there are lots of seats open now. Get your application in. Get your secondary applications done. Brush up your interview skills and get ready… this could be your time. We Want Hear From You! OsteopathicMedStudent.com is looking for your application, interview, acceptance, or even rejection experiences. We would love to provide students with the most information possible so they can make the most informed decision possible. Please, if you have a moment email your experience to me. Stories sent in may be posted in part or in their entirety on this site. We would like to post as many stories as possible. WVSOM’s interview day was very relaxing. My interview day started at 10 AM. Half of the people had their interviews first thing at 8 AM and the rest of us were interviewed after the presentations, tour, and lunch. WVSOM seemed to feel that keeping the interview day very personal was a way to make interviewees feel at home and comfortable (I rather enjoyed how comfortable the day was). We started off the day in the foyer where we all sat in a circle in nicely padded chairs. There we had quick presentations about the school. 1- What do you do when you find you are struggling in a class? 2- How will you handle the fast pace and difficulties of medical school? 3- Why do you want to be a DO? Why did you only apply for osteopathic schools? Obviously there were more questions than that, but they seemed to be fairly standard “getting to know you” questions. I was a little doubtful because of how much they seemed to focus on some past struggles. Only one of the people interviewing me seemed to really care (the PhD), but the other two seemed to think that my more recent academics and my plan I presented proved that I could handle the stresses that would come. Apparently my answers were good enough because I found out two days later that I was accepted. WVSOM’s online system is nice because you don’t have to wait for the letter to come in the mail; you can check out your account whenever you want to see for updates. My acceptance was already posted by the time I got home from the interview. Talk about a stress reliever. And now for other interview day information. First we heard from different faculty members and the financial aid office. About the only bad thing about the West Virginia School of Osteopathic Medicine was the tuition for out of state students. Now, the tuition is high, but the cost of living is relatively low. Because of this the overall budget is still high but is closer to being competitive with DO schools in places like California, and it is quite a bit lower than the budget at Michigan State University. After the presentations we went for a tour of the campus. It was a very nice campus. I really liked how spread out the campus was, and that you were able to go outside when moving between classes and buildings. The WVSOM anatomy labs was huge and was very clean, both visibly and smelling. The cadaver tables are equipped with special ventilation systems to remove the special stench that most labs have. The classrooms were nice too. The classrooms are very large lecture halls with nice chairs. Each room also has 3 screens for powerpoint presentations. They also record all the lectures for students so you can download them later. It seemed like a pretty nice setup. WVSOM is also building a few new buildings. One of them is going to be a really nice gym, or “wellness center.” I wish I could remember what the other building was, but I remember it sounded nice, something like a research center…I don’t quite remember. All I know is that WVSOM was one of my favorite schools I have seen and if you get the chance to interview with them I would highly recommend it. In a previous post I mentioned that I interviewed with LECOM-Erie. I thought I would give you a quick idea about how their interview day goes. It was my first interview and it was about two months ago so the details of time are hazy, but I definitely remember the interview very well. The day started around 8 AM and I arrived about 20 minutes early. I know it sounds way early, but I was not the first person to arrive. Two other interviewees arrived up to 30 minutes earlier than I did! To start the day about 10 med school hopefuls piled into a conference room. At this time the director of admissions came in and started to get to know us. When he got to me he started speaking in fluent Japanese (luckily, I know Japanese). Always be careful about what you put in your application. You never know what a school might test you on. Their day ran fairly similar to other schools interview days. After the introductions we were privileged enough to sit through powerpoint presentations about LECOM. Then we got to hear from the financial aid office and other administrators. These activities took up most of our morning. Right before lunch was the interview. At LECOM they have recently decided to use a different interview method than other schools. I was interviewed by a 2 person panel. One interviewer was a man with a PhD in English and the other was a physiology instructor for LECOM. Neither of the men had ever seen my file. Because of this they had no knowledge of my past academic history, MCAT score, research or clinical experience. They had never even read my personal statement, secondary essays, or letters of recommendation. LECOM feels that if you made it to the interview then those aspects of you application are competitive enough and now your interviewers need to find out what kind of person you truly are. We spent most of our interview talking about my family (my wife and kids), and about my experiences that I have had serving as a religious representative in Japan for my church. 1- Why do you want to be an osteopathic physician? 2- Have you applied to any allopathic schools? 3- Why would you want to come to school at LECOM? 4- Do you have any concerns about attending school in Erie? As you can see, none of these are particularly difficult. I didn’t have to explain anything in regard to question #2. I only applied to DO programs. Even if you did apply to MD schools, don’t worry, just make sure that you acknowledge the differences between the two methods of medicine and that you are very excited about the benefits provided through studying osteopathic medicine. The whole interview lasted about a half an hour. It went very quickly and was very low pressure. I found it very refreshing to experience an interview with a closed file. Both men were friendly and never seemed to be interested in intimidating their interviewees at any time. After the interview we had lunch with a couple of students that were able to talk about the different learning methods at LECOM and answer any questions about living in Erie. Of all the places I interviewed Erie was definitely the most non-rural place to live. After interviews and lunch we had a few more presentations and ranked our learning style preference, and stated if we were interested in attending the Seton Hill campus. With LECOM-Stone Hill as an option you are essentially interviewing for one of over 300 seats in their school. This should be a big comfort to many people out their knowing that your odds much greater here than at most other schools in this nation. Interviewing for medical school can be a nerve-racking experience for anyone. You have been working toward this moment for a long time and now the moment has arrived. Relax. You have no need to worry. The school that has invited you for an interview invited you because they already like you. Schools do not invite you to interview with them so you so they can mock or taunt you! They spend money when you come to visit. They are to printing information for you, providing food, and paying physicians and teachers to interview you. This would be a huge waste of time and money for them if they didn’t think that they want YOU to attend their school. When I interviewed with schools I was worried that they would notice that 5 years ago I got a D+ in calculus, or that last year I earned a C+ in the first semester of organic chemistry. Reality is that only one school even halfway brought up the C+ (only to comment that I did improve in the o-chem 2) and nobody mentioned the calculus grade at all. I’m not saying don’t be prepared to counter such questions, but realize that they already know about these flaws and they still invited you to check out their school. This is your chance to show that you are a person that cares enough about other people to be a physician. Take the chance to show that you are more than a pile of statistics and that you will be the type of physician that will represent their school well! I know it sounds silly to tell you not to worry, but remember, they already like you. Show them they were right to invite you for an interview. Harrogate, TN, is a very small rural community. Luckily, it is just a quick tunnel drive through a mountain to Middlesboro, KY, which has a population of roughly 10,384 (someone may have moved recently). Lincoln Memorial University is a smaller school itself; however, they do have many graduate programs. The DeBusk College of Osteopathic Medicine is one of the more recent programs at the school. DCOM is a nice school. On interview day we all sat down in a board room and had a few presentations. During the presentations someone said, “We might just be the most technologically advanced medical school in the nation.” I heard that and thought, “Sure, every school thinks that.” However, while touring the school I was very impressed. They might really stand up to their claim. Of all the schools I have visited, DCOM definitely the most advanced school in terms of technology. I was particularly excited when we were shown how all the lectures are audio and video recorded, and are quickly made available for students to view and study with. I have found it useful in my premed studies to listen to lectures again, and feel that video would only enhance my learning experience. As with other schools, DCOM also utilizes robots for students to practice what they are learning. These simulators are impressive and deserve a post of their own. DCOM is a new school, but the faculty is not new to teaching in any way. All of the teachers have taught before. Some of the teachers have even been deans at other medical schools before starting at DCOM. I could be mistaken, but I remember one of the presenters stating that currently all of the faculty even writes for the national exams. This is a new school, but they are set up for success.